As published by the U.S. Patent and Trademark Office, Apple's application for "Method and apparatus for three dimensional printing of colored objects" describes a basic 3D printing machine capable of outputting multicolored structures. While such printers exist, most are positioned as professional prototyping and industrial tools, with even "affordable" models costing as much as a well-appointed automobile. Apple's proposed system is based on modern 3D printing technology, which builds three-dimensional objects by depositing layers of material —usually plastic —onto a platform as specified by a digital image file. Most solutions heat and squeeze PLA or ABS filament through a motorized print head connected to support bars, a setup that allows for movement along X, Y and Z axes. 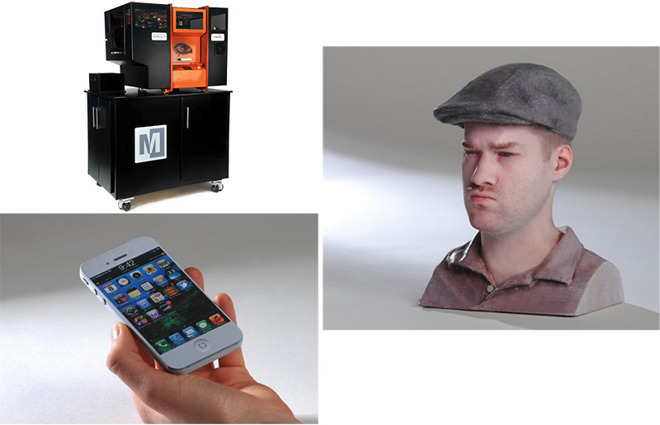 In general, current consumer 3D printers with linear feed mechanisms are limited to single color creations. Changing out filaments is possible, but the process is hardly ideal and may not result in high quality prints. Apple proposes a system that uses two print heads, one for depositing material and another for applying color. In some embodiments the color head is aligned in parallel with the material head on the same support bar, while other iterations place the color head on a separate side support. Both scenarios call for color to be applied while the material print head shoots liquid-to-solid material on a moveable platform. Suitable methods for color application include inkjet technology, spray nozzles, airbrushes and multicolored markers. In one version, the print head deposits a layer and moves up and out of the way as the color head comes in to add a layer of color. Another embodiment has the print head complete the build before the color application head moves into position for paint application. A moveable platform provides an assist in Y-axis movement. An alternative method incorporates a rotatable color application nozzle capable of moving 360 degrees around the print head. This enables both heads to be active at the same time. A mechanical arm is used in yet another embodiment, which again boosts efficiency. Apple goes on to detail alternative coloring processes, including an option to sand, buff or otherwise finish a 3D object prior to adding color. It remains unclear if Apple intends to bring such an intricate device to market, but the patent language does contain references to home use, an example being the creation of toys. 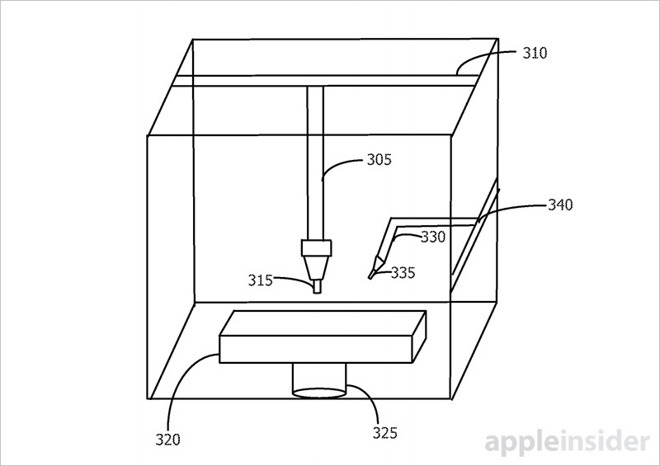 Apple's multicolor 3D printer patent application was first filed for in May 2014 and credits Geoffrey Stahl and Howard A. Miller as its inventors.